"Municipal ordinances are presumed valid, and will be construed in light of the presumption of validity," Ohmer wrote in his opinion. "If, however, an ordinance conflicts with the general laws of the state, the ordinance is void and unenforceable. Ordinance 70078 conflicts with state law because it prohibits activities that are permitted by Sections 290.500 to 290.530 (the state's minimum wage law)." Ohmer heard oral arguments Oct. 6. He had declined to issue a temporary restraining order, saying he would issue a final decision before the increase took effect. He kept his promise, with about seven hours to spare. 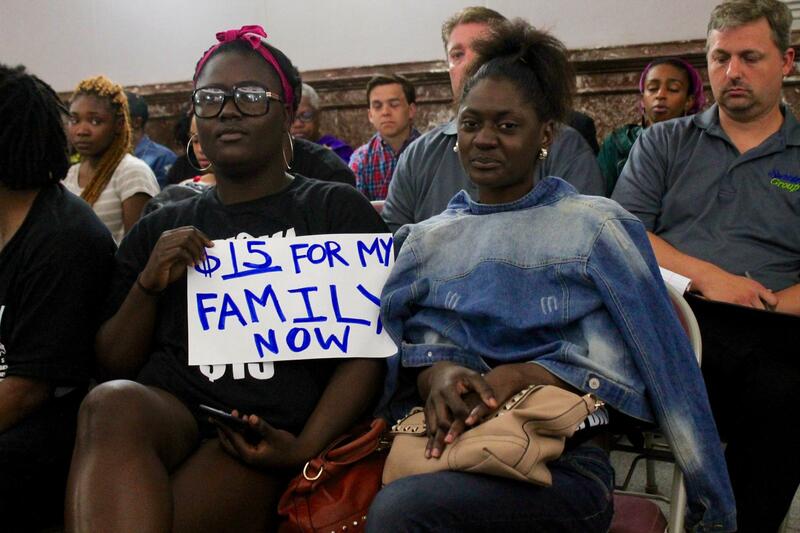 Supporters of raising St. Louis' minimum wage listen to testimony at St. Louis City Hall on June 16. Ohmer's ruling marked a victory for a group of business interests, including the National Federation of Independent Businesses and the Missouri Chamber of Commerce and Industry. They had argued that provisions in both state law and the Missouri Constitution restricted the city's ability to increase the minimum wage on its own. The Missouri Bankers Association had successfully advanced similar arguments against a St. Louis County foreclosure mediation requirement in 2014 -- Jane Dueker was the winning attorney in both cases. The city made a forceful moral case for increasing the minimum wage, arguing that the complex challenges facing St. Louis required "decisive, immediate action." Legally, attorneys said St. Louis aldermen were empowered by the city's charter to enact "all ordinances that promote the health, safety, peace, comfort and the general welfare of those who live and work here. Thus, the city has the general authority to adopt a minimum wage ordinance unless prohibited by state law." Dueker said she was pleased with Ohmer's ruling. "I'm really hoping that this will sort of restablize the business community in the city," she said. "I was really surprised by how destabilized the business community - at least the people that I've been dealing with - have felt over this." The city will appeal the ruling. "We've always known these issues would be resolved by the appellate court. We are heartened that the judge agreed with the city on three of the five counts, but disappointed in the court's decision on two of them," said Winston Calvert, the city's attorney. "We will appeal the ruling, with the hope that higher courts will affirm the City's authority to adopt its own minimum wage law." Shorter min wage ruling: State already regulates wages, has a minimum wage. Missouri cities can't. The judge's ruling does seem legally sound, but Missouri can, & should raise minimum wage statewide. Alderwoman Megan-Elliya Green, D-15th Ward, said she looked forward to the city's appeal. "I do think there's a lot of room for debate on the issues, especially as it relates to our lack of jurisdiction and over-reach or conflict with the state minimum wage law," Green said. "I think most of us went into this believing that the current minimum wage law would be considered a floor, and therefore we're not superseding any state law because we're acting in excess of the state law." Green said the push for a higher minimum wage will continue at the state level -- with some familiar foes. "Even if we take this to a statewide level, we expect these same plaintiffs who profit off these poverty wages will be at the table fighting back just as hard," she said.